I had the most wonderful day today spent with a group of like minded cupcake addicts making and baking and learning all about cupcakes and decorating them. 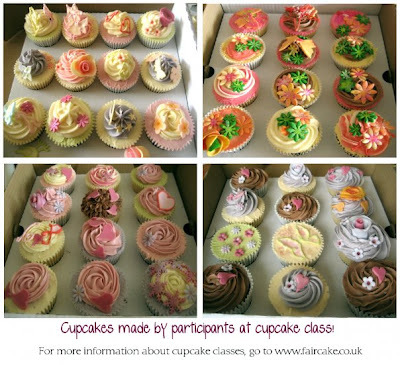 Run by Fair Cakes, the day course looked at baking vanilla and chocolate cupcakes, creating royal icing shapes and fondant icing flowers and other decorations. We had a wonderful teacher who made it all seem so easy and I started to wonder why I hadn’t been able to work it all out by myself. But sometimes it’s just good to share. I’ll post some more pictures later but here’s a picture taken by Shikhita, mine is top left. I’m very excited by my new skills and now want to practise practise practise!!! This entry was posted in Courses, Cupcakes on 9 May 2009 by Claire Gevaux.